How to make the best mosquito repellent soy candles. 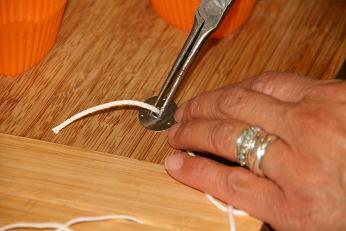 Making soy candles with essential oils....in less than 15 minutes !! Step by step instructions for Homemade Mosquito repellent Soy Candles .... it takes less than 15 minutes ! How to make homemade mosquito repellent soy candles ....this is so easy to do and takes only a few minutes from start to finish, the poured candles are ready to use in 4 - 5 hours....less if cooled quickly !! Really..... just melt soy wax, add your natural mosquito repellent essential oils and pour into your mold ! Making your own candles is fun, simple and very cost effective, I tend to have a candle or two burning most evenings, out in the garden on a Summers eve or inside the house to deter the biting mosquitoes and midges........these candles not only give out ambience, serenity and of course aroma but they effectively deter and repel mosquitoes and other insects. Soy candle making is extremely quick to do and the permutations of mold design, colors and shapes, decoration and packaging are endless, for me natural and organic is my choice along with essential oils to fragrance my candles.....I have a philosophy of keep it simple which is why soy appeals in preference to paraffin wax. Soy candles are not sooty or toxic, soy candles are naturally biodegradable, the source of hydrogenated soybean oil is renewable, they burn for longer than a conventional paraffin candle and if spilt the wax washes away with hot soapy water. Soy flakes for making soy candles and other candle making equipment for example, wicks and sustainers (the little metal bit that holds the wick) can be purchased very easily on line or from your local craft or hardware store. Instructions for homemade mosquito repellent Soy Candle Making.....How to make mosquito repellent Soy Candles .....a pictorial guide ! Assemble your mold of choice, the choice is endless, jars, cups, silicone cake trays, any small vessel really.....if it is glass or ceramic, warm it gently by either washing it in hot water or placing it somewhere warm. 25ml water use 25g soy flakes. Other Equipment you will need and a note of caution. Something to heat the wax, use your preferred heating method. 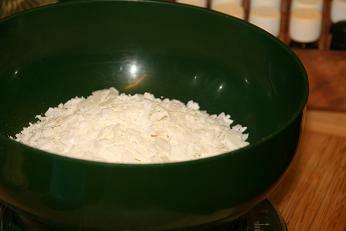 This can be a microwave and a glass or microwavable pot (absolutely my preferred method), a slow cooking pot or a Bain Marie type of arrangement, which is a large pot of boiling water turned to a simmer into which you place your smaller pot or Pyrex jug, just as an aside, in Greek this is known as "kaminos Marias" or "the alchemist's apparatus" the furnace of Maria.........she being an alchemist......I digresss! A thermometer (although not essential !) just for reassurance really as all you need to do is gently heat the wax until it melts clear ! Some form of stick to enable the wick to stay upright ....a wick stick which again can be anything from a cocktail to chopstick, the idea is to keep the wick held high and the sustainer held down.....I have a friend who swears by her sticky dots if you will, placed beneath the sustainer and pressure applied before the pouring of the soy candle wax begins, alternatively just use premelted wax(! ).........the wick can be held by clothes pegs, paper clips, blutack, clamps or even threaded through a hole in the stick, if it is wide enough !! 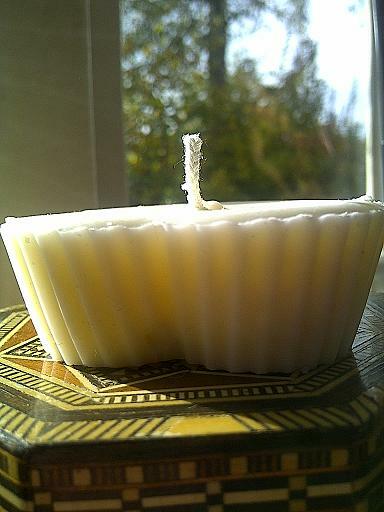 10 drops of essential oil for each oz or 25g of soy flakes.....it sounds a lot but the idea is to scent your candles ! Recipes for homemade mosquito repellent soy candles. In equal amounts ... that is 10 drops for each 25g of soy flakes so adjust the ratios depending upon the size of your candles. For example for 75g batch of soy candles you would need 30 drops of your chosen blend of essential oils in equal amounts.... 10 drops each of the 3 chosen essential oils equals 30 drops. 1.Citrus Blend - Lemon Essential oil, Orange essential oil and Rose Geranium essential oil. 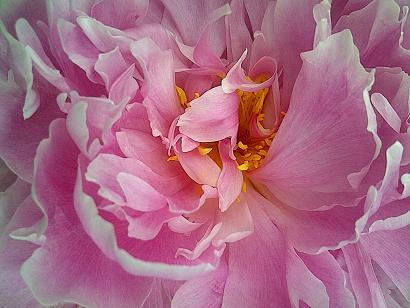 2.Floral Blend - Lavender essential oil, Rose geranium essential oil, lemon essential oil. 3.Zingy Blend - Peppermint essential oil, Bay essential oil, Eucalyptus essential oil. 4.Vavavoom Blend - Citronella essential oil, Thyme essential oil, Black pepper essential oil. 5.Garden Blend - Lavender essential oil, Rosemary essential oil, Basil essential oil. How to make homemade mosquito repellent Soy Candles. 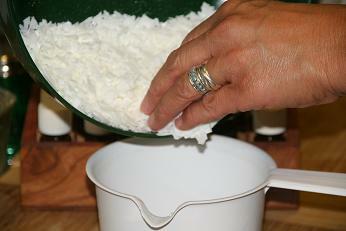 Weigh out the required amount of soy flakes. Ensure your molds are ready, clean and dry and if need be... warmed. Attaching the wick to the sustainer (the little metal tab!) with pliers. A cocktail stick suffices ! 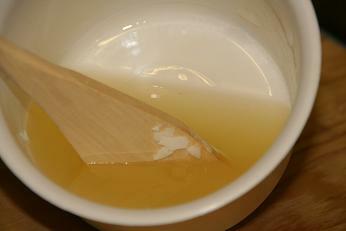 Heat your soy wax flakes gently until the wax appears clear. Microwave - Cover the flakes, heat for a 30 seconds at a time, in between each 30 seconds, take out the soy flakes and stir, heat until the wax has melted. 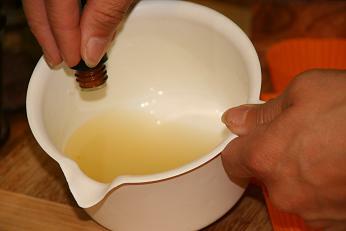 A Bain Marie - bring the water to boil, turn down to simmer and place the pot containing the soy wax into the simmering water, allow the wax to melt whilst stirring gently. 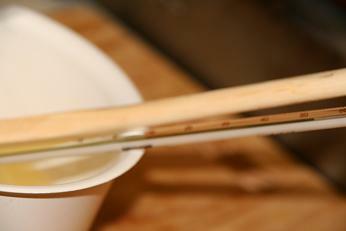 A slow cooker or Kitchen Kettle - Gently heat the soy wax on a low setting, stirring gently until melted. If you want to measure the temperature, anything between 140F to 180F is just fine, as long as all the wax has melted,( the wax will be clear) which at this temperature it will of done. Add your essential oils....please go to Anayennisi Aromatics Soy Candle fragrance page for lovely ideas! 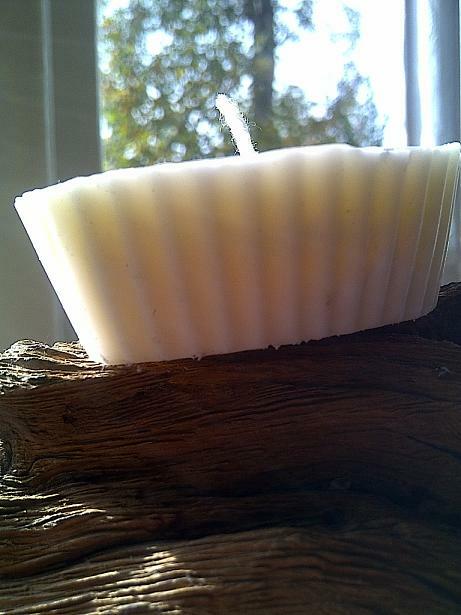 Stir the essential oils well into the melted soy candle wax. 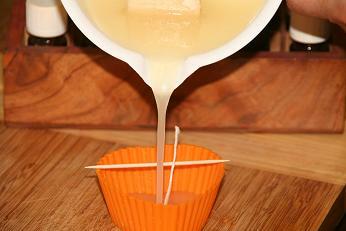 Pour the melted soy candle wax into your mold, keeping the wick upright ! Now you have to wait.......only 2 hours if cooled quickly - 4 hours at room temperature. Any splashes and equipment can be cleaned with hot, soapy water. 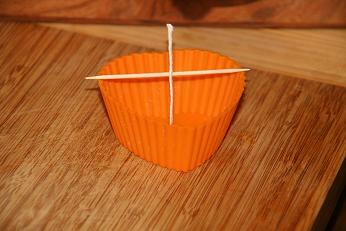 When the candle is turned out of the mold, trim the wick to 0.5 cm or 1/4 inch. Decorate as you please, light and enjoy the aromas of essential oils or better still give to friends to enjoy....share Anayennisi Aromatics.... How to Make homemade mosquito repellent Soy Candles with your friends too...... with the share button! Try adding petals, lavenderheads, shells, cinnamon sticks, zest of lemon or orange or leaves to the outside of your mold, adorn with raffia and string and handmade labels. 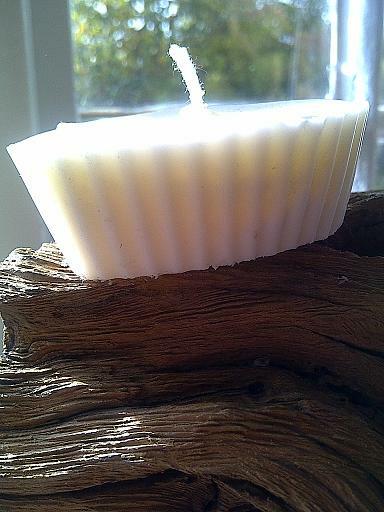 Go to Anayennisi Aromatics home page from Homemade mosquito repellent soy candle recipes. 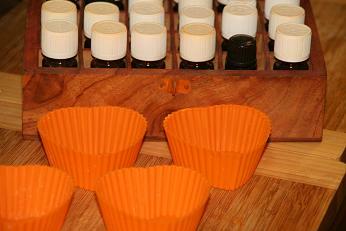 Go to the Essential Oils page for more information on essential oils.